Minister of Plantation Industries Navin Dissanayake has attended series of meetings on Tuesday during his four-day visit to Japan. He had a meeting with Japanese Minister of Health Labour and Welfare Katsunobu Kato. In his opening remarks, the Minister expressed the solidarity of Sri Lanka and its people with Japan on this hour of tragedy occurred due to recent floods in Western Japan. He also indicated the historical bond and affinity between Japan and Sri Lanka. Dissanayake briefed the Minister of Health Labour and Welfare in Japan on number of progressive steps taken by his Ministry to ensure the utmost quality of Ceylon Tea being exported to Japan. The Minister also emphasised on the importance of the Japanese consumers’ confidence which is placed on Ceylon Tea, and assure Sri Lanka’s commitment to keep this confidence intact for decades to come. The Minister also indicated Sri Lanka’s willingness to work with Japanese health authorities in resolving any pending matters pertaining to supply of highest quality teas for Japanese consumers. 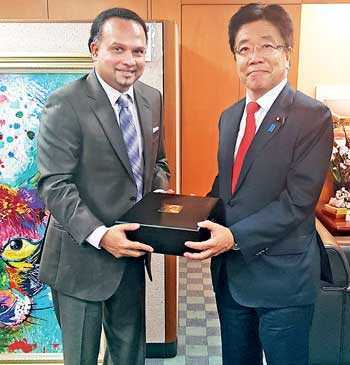 In welcoming Dissanayake, the Minister of Health Labour and Welfare in Japan stated the bigger role that the Minister could play to develop the two country relations being the President of Japan-Sri Lanka Parliamentary Friendship League. In responding to the Minister’s detailed explanation on the current status of tea exports to Japan, the Minister of Health in Japan appreciated the steps taken by the Ministry of Plantation Industries. He also noted the ongoing dialogue between the authorities in two countries. Along with the Minister, this meeting was attended by the Ambassador to Sri Lanka in Japan and its officials, Official from the Ministry of Plantation Industries and delegates from the Sri Lanka Tea Exporters Association. The Minister also attended a meeting with higher officials of the Tokyo MUFG Bank to discuss the proposed loan arrangement for the modernisation of tea smallholderfactories in Sri Lanka. During the discussion the Minister highlighted the importance of the project for both countries. The Tokyo MUFG Bank is the largest bank in Japan and it was named as the 10thTop Bank in the World by ‘The Banker’ and was the only Japanese bank to feature in the Top 10.